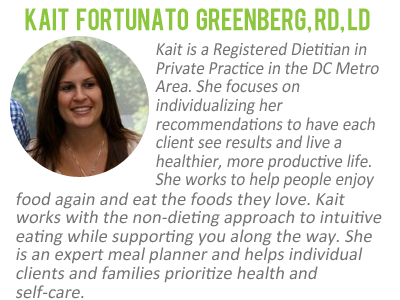 Today I bring you a guest post from Registered Dietitian Kait, who works in Private Practice in the DC Metro Area. She uses the non-dieting approach to intuitive eating. Check out her blog Rebel Dietitian for meal planning tips and recipes, self-care ideas, and ways to embrace the rebel mentality! 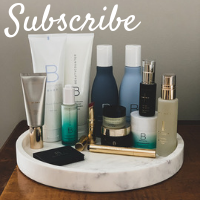 I am so happy to be sharing a post on one of my favorite blogs with one of my favorite RDs. You see, as a Dietitian in private practice I often have clients coming in thinking we are going to put them on a strict calorie-counting plan and take away all of their favorite foods. While this may work temporarily, it is nearly impossible to sustain and you often end up right back where you started. The minute you restrict certain foods or start looking at foods as good or bad, you are at risk for overeating at a later time. Rather than focus on calorie counting and the number on the scale I encourage you to eat what you love while striving for balance and eating mindfully. I encourage you to REBEL against the diet mentality and embrace your love for food. Instead of tracking calories, track your hunger level and mood before and after all meals. Identify trends and ask yourself why am I eating? Am I really hungry? Am I stressed, bored, happy? What do I really want to eat right now? Here are some various scenarios that can detail the difference between dieting and rebelling. Diet: You are really in the mood for a hot meal, but instead make the same salad with grilled chicken. Perhaps you overeat later in the day because you are not satisfied or rewarding yourself for “having a good day”. Rebel: You take the time to determine what you are really in the mood for. You sit down at the table, turn off the TV and really savor the meal you just prepared. Diet: You haven’t eaten all day in preparation for your big meal. You are starving when it comes time to order and end up eating 3 pieces of bread before your meal even comes. Another boring salad shows up and you are savoring over your husband’s dinner special. Rebel: You sit down to dinner excited to try something new. You enjoy a piece of bread out of the basket and are impressed when your seasonal entrée shows up at the table. You check in with yourself halfway through and realize you are actually full, great leftovers for tomorrow! Diet: You feel like you cannot skip a day of exercise or you feel really guilty. Maybe you can convince yourself to work out if you promise yourself dessert later on. 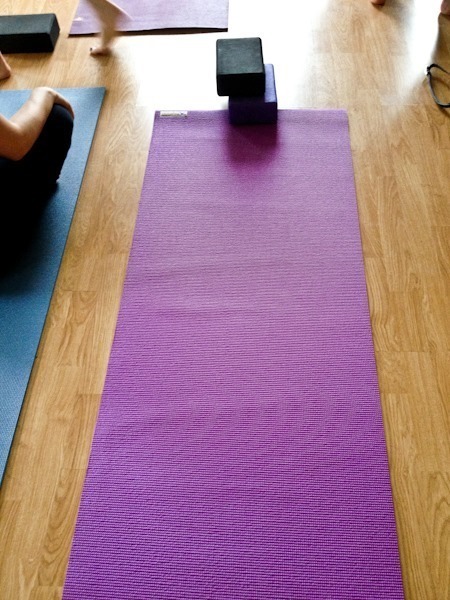 Rebel: You look forward to a fun exercise class and you enjoy the feeling when you are done. Maybe it is a way for you to be social as well, taking a run with friends. Your eating is not affected by exercise. Diet: You are in the mood for something sweet but could not even fathom the thought of enjoying dessert. Instead you have your sugar free pudding or chocolate candy, perhaps going back for a second one because it was unsatisfying. Not to mention your stomach is now hurting from that artificial sweetener. Rebel: You are in the mood for something sweet and are able to enjoy one serving of your favorite candy. Or you take a walk to your favorite dessert spot and share something small with a friend. Diet: You may put your life on hold until you achieve a certain weight or compare yourself to others. Perhaps it is hard to go out to eat with friends or enjoy meal times with your spouse or family. Rebel: You learn to start your day with positive affirmations and appreciate what your body can do for you. Your success is not measured by the number on the scale. Diet: Snacks are forbidden since added calories cause weight gain right? You are starving at your next meal and have a hard time watching your portions. Oh well, tomorrow is a new day. Rebel: You learn to fit in snacks in between meals if you are hungry. It is OK to fit in fun foods and you learn how to balance them accordingly. This really helps with portion control at your next meal. Please remember that food is not the enemy. Life is too short to be counting calories. Fuel your body with foods that you enjoy. LOVE this post. It’s been said before but balance is key. Intuitive eating works! While I really appreciate your message I must say that I am a bit disappointed by your comments about saving half of a restaurant meal as leftovers, and walking to dessert only to “share something small.” For me the point of intuitive eating is to be able to avoid expectations like only eating half a meal or sharing dessert with someone. Sure, if that’s what my body wants and needs that day then that’s what I will do, but I feel like your examples just sent a message to thousands of women that intuitive eating is about restriction. Thanks for your comment and appreciation! I am sorry if the message was confusing but that was actually exactly what I was hoping to work against. Of course if you wanted the whole meal at a restaurant you could finish it, the point I was making was if you eat slowly and mindfully sometimes you realize you were actually satisfied prior to finishing! Same goes for dessert–I still think it is important to practice portion control –eating whatever you want but in the correct amount. It’s confusing I think with restaurant meals and desserts as I made the assumption they are always larger than what we make for ourselves at home-good reminder that this may not always be the case! I totally get where you are coming from. I think it’s OK to set some sort of loose guidelines, like “leave a few bites on your plate.” It helps keep you in check. And whenever I pause midway through a meal to assess my hunger levels and then stop eating, I usually always realize that I don’t NEED more food. Of course you may WANT to eat more (and that’s fine sometimes), but I have never left a meal feeling hungry – even when I just ate half or had a few bites of dessert! Just what I needed to read today. Thanks for this post! I LOVE this post! Such a great reminder for those who are dieting or even those who are not happy with the body they are in! I love last point you made, “food is not the enemy. Life is too short to be counting calories. Fuel your body with foods that you enjoy.” Something I feel most people should be telling themselves everyday! Although I don’t diet…I think this is a great approach for people who do! A much healthier approach and mindset! My thoughts exactly! This is what I walk around telling people when I am asked my opinion of “diets”. Good points! I also think it’s important for those just starting with intuitive eating to realize that the less you eat sugar and processed foods, the less good they taste. It will take a while to get there, but honestly? After a while listening to your body, you won’t even crave the bad stuff. At least, that’s how I’ve found it. Thanks for this post. I definitely struggle with not counting calories. It’s something I’ve always done and I find it comforting (even though it’s obviously more healthy to just respond to our bodies natural hunger signals. Do you have any advice for people who actually like counting calories? Do you think it’s just a crutch or can it really be healthy for some people? I’m a person who actually likes counting calories, and as a former anorectic who can get REALLY obsessive and restrictive what I’ve found is that setting your calorie goal as a target to meet, rather than a number to be “under,” is super helpful. It’s encouraging to me to take a look at my calorie goal for the day and think of fun, healthy, delicious ways to hit that target — rather than looking it as reminder to cut things out of my food life, I use it to remind myself to add things to round out my day and keep my food varied. It’s also useful to think of it as a tie-in to your own intuition (how can I make what I really want or need fit in healthfully) instead of a rigid dictator of your food choices. Such a great post and message about balance! =) Thanks for sharing with us!!! I seriously LOVED this. Kath, you helped me so much in my steps to recover from an ED. I realized I got eat whole foods that I enjoyed and kept me feeling good- I realized thru your blog that I didnt need to starve myself to be healthy.. So thankful for this post and for you and this blogger you have spotlighted today! Thanks for your comment and for sharing your inspiration regarding recovery. Thanks for this. I’m curious, though. Do you really expect your eating not to be affected by exercise? I realize you can eat away exercise gains (in terms of calories) pretty quickly, but it seems like you would want to make sure to refuel your body after strenuous exercise. Am I mistaken? I ask because I have bumped up exercise from 3 times per week to 6 recently, and I do notice that I have started overeating in the evenings. But I’m wondering if I *should* be to some extent? Hi Katie–I realize that statement could be confusing..I was saying not affected by exercise in the sense that you “reward” or “deprive” yourself based on whether on not you exercised that day! I would be hesitant to give specific nutrition advice in this forum but I think exercise will naturally increase hunger levels as a whole so you may want to look at all your meals/snacks during the day to see if something is missing that is causing overeating at night. I do in fact think that your appetite would increase as a whole if exercised increase! Also being mindful not to use food as a reward for exercise like in the example above! I think the point was that you don’t “exercise to eat”. But if you’ve recently upped your exercise intake, i think it’s natural to notice an increase in calorie consumption. And you do want to refuel! Great article!! Thanks for featuring Kait! I think you both are doing outstanding work! Gotta love the REBEL against dieting approach and enjoy delicious foods for lifelong success. Love this so much! I teach my clients the “rebel” philosophy, too. Great post. amazing tips! diet mentalities can be so harmful to us, and lead us with distorted views of what we need to eat/do and what the “perfect’ body is! What happens when intuitive eating turns into unwanted weight loss? I feel like I have a great grasp of eating until I’m no longer hungry, not until unhealthy fullness and I try and eat as soon as i feel hungry. However, recently i’ve begun dropping weight that i don’t want too (a pound a week on average for the past 2 months) and I’m worried that its because my added strength training (HEAVY strength training- Olympic lifting and power lifting) is requiring me to intake more calories than I’m actually HUNGRY for. What is your advice to someone who needs to eat more than they are actually hungry for? Thanks for your comment! Intuitive eating is an excellent thing but may not be appropriate in every situation. As an athlete with extraordinary training it is important to add fuel above and beyond to make sure for added demand on body, which also means additional fuel before/after each training session which means eating when not hungry for these times. Unfortunately not every case can use intuitive eating 100% –athletes, clients in recovery from an Eating Disorder, or other medical complications that may require more calories.This is a special situation and I would definitely recommend working with an RD for an individualized plan. Love this! I totally agree with the idea that as soon as you restrict something or ban it you just want it even more. Great tips to have, especially around this time of year. Absolutely love this post! I am pregnant and have spent the last year preparing to change the way I think about food and my body in preparation for this amazing time, filled with changes to my body. This was a great read! Thanks for your kind words! And Congratulations on your pregnancy. Love this post! Some great tips, thanks for sharing! A fellow RD from the University of Maryland (& sorority sister)! Nice to see Kait featured here! Wow!! This is a great post and fortunately supports the road I’m on but I still have my moments of self doubt that I need to be more restrictive. Thx! I really needed this! I like the philosophy of this post, but how is it compatible with weight loss? I see it works for weight maintainence and as a general way of living and eating, but if you are a trying to lose a few pounds, don’t you really need to take greater steps? Hi Sara! We actually weight loss as a side affect of intuitive eating all the time. The idea I eating what you want in the right portions allows this to last for a lifetime! That being said it may not be the approach for everyone. Another fellow RD here. 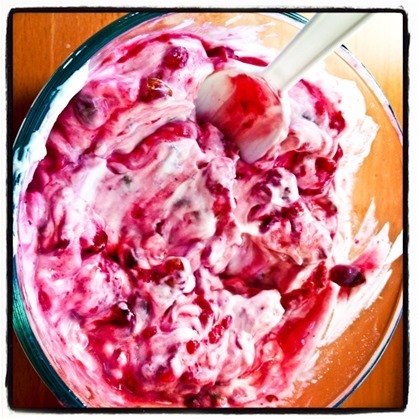 Great post that clearly and simply lays out intuitive eating with concrete examples. Thank you! I sent the link to a friend who I had been explaining IE to just the day before this post came out. She and I are both post-second baby and dealing with that tough stage of trying to be healthy and lose those last lbs while dealing with the craziness of a baby and a toddler. Counting calories is often too time consuming and mentally exhausting at this stage in life and intuitive eating is really a great approach now (or at any time, but especially when food logging or calorie counting just seems waayyy too daunting). I must be honest, but I just don’t get the concept of”dieting”in general. If you feel heavy, eat less, if you’re too light, eat more. Maybe I have a different metabolism, but I think you just eat what makes you feel good. I gained two pounds so I recently cut out the avocado and walnuts in my daily lunch salad. No biggie. Just don’t obsess or make it your life. 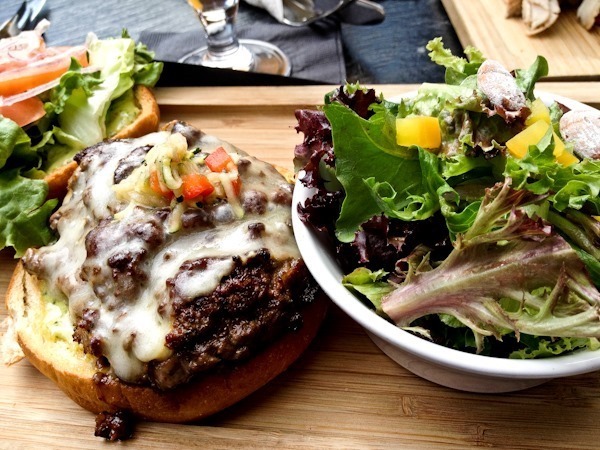 Eat a burger when you want, but you probably only want one about every 4-6 months. I love toast with butter, eggs, green salad, string cheese,sweet potatoes, and well, that’s about it. it’s not too hard to not eat cupcakes everyday. This was such a refreshing post to read, and such a wonderful mindset to adopt in relation to “dieting” and food. 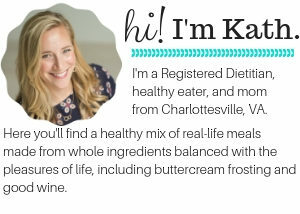 I too am a Registered Dietitian, but sometimes refer to myself as a Radical Dietitian. That is, I don’t live by or prescribe any rigid dichotomous thinking about food. I loved the way this post was broken down into different aspects of life and meals. I absolutely whole heartedly agree that too often people derail their own diets by being too restrictive. If you listen to your body and take a positive approach to eating well, you WILL be healthier and happier. Thanks for sharing this. I live in Toronto and am just gearing up to deliver a segment on daytime TV with some tips for mindful eating.